My name is Jamie and I’m an AWL NSW Inspector. Today I want to share the story of a dog I recently rescued from a life of pain and neglect. A dog that inspired me with his courage and will to trust, despite being one of the worst cases of neglect I’ve ever seen. His name is Nitro. When I first saw Nitro, I thought he was dead. This large, emaciated body was limp and lifeless on the ground. He was literally skin and bones and was dangerously underweight for his size. 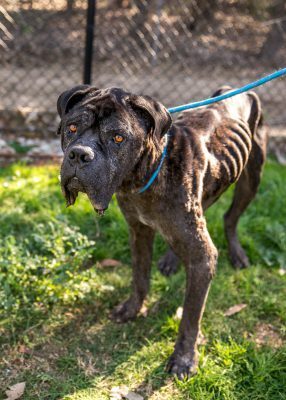 Not only was Nitro severely malnourished but his skin was mange-ridden and bloody from the desperate attempts he had made at relief. Just the slightest movement caused him pain. Opening the vet kennel, I slowly reached out my hand to Nitro and whispered ‘G’day Mate’. He slowly raised his head and a pair of heartbreakingly sad amber-coloured eyes looked straight at me. His little docked stump of a tail began to wag gently. 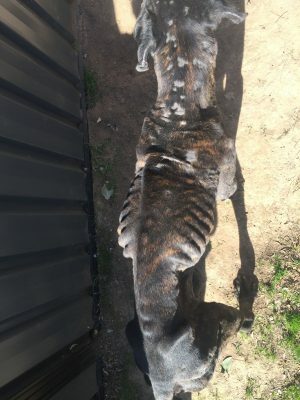 Nitro was so emaciated, that he seemed to sink into the very floor he was laying on and his mange-ridden skin was an unbearable sight. Trickles of blood appeared on his face, in areas where the tissue had torn open. He’d lost all the fur on his body except for a few brindle tufts. His skin was ridged with scarring and who knew how long he had been suffering in this condition. Despite all he’d been through, Nitro was a still a friendly boy seeking human contact and affection. Too weak to walk, I carried Nitro gently to my vehicle and then placed him into protective custody. He was shockingly light for his breed. 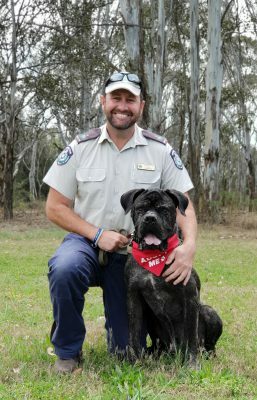 A strong, healthy male Neapolitan Mastiff can weigh up to 70kgs – but Nitro was a mere 40kg. His road to recovery would be a long one. 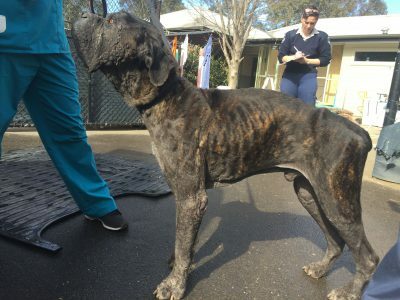 Nitro was taken immediately to our veterinary clinic at Kemps Creek. With a sweet face like his, it wasn’t long before Nitro was winning hearts and becoming a favourite amongst our vet team. It was a huge relief knowing that Nitro was now safe and that his rehabilitation was underway. But I couldn’t help but wonder how long had Nitro been this way. I began to ask questions, and when I was informed that he was picked up wandering (in appalling condition) very close to his home, alarm bells rang. Our Head Vet advised that Nitro had been starving for up to 6 weeks when found, so he’d been deteriorating for some time. It was then that I suspected that his owner had been neglecting him. I began collating the evidence to take Nitro’s case to court. 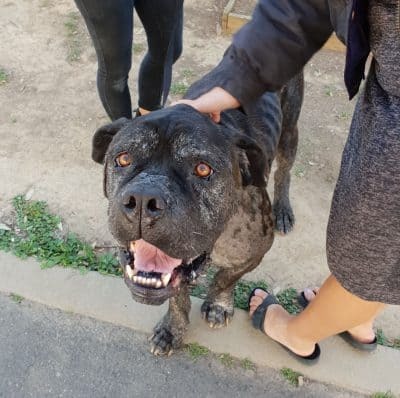 At 9.30am on the 27th of September 2018, Nitro’s owner was charged with two offences under the Prevention of Cruelty to Animals Act: failure to provide proper and sufficient food to an animal, and being in charge of an animal and failing to provide veterinary treatment. 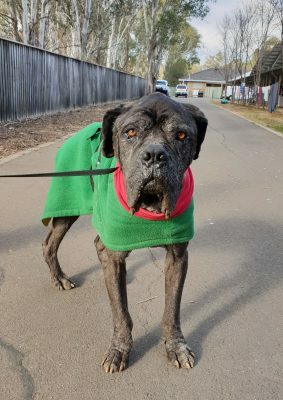 His owner was found guilty on both charges and fined $1000 for each offence ($2000 total), and Nitro was surrendered into our care. Nitro’s owner was held to account by the law, and I’m thankful for the role I could play in the prosecution. When people ask me how I feel when I’m called to investigate cases like Nitro, I answer honestly. I feel angry. Furious. It’s disgusting that this beautiful dog should have suffered this much. It’s revolting that someone allowed this to happen. Sadly, this sort of neglect isn’t unusual. People may think animal it doesn’t happen much, but cruelty and neglect of animals in our state is all too common. That’s why my job is so important. We were lucky to have a successful conviction for Nitro, but it couldn’t have happened without your support. At the time I write this, Nitro is continuing his rehabilitation at our shelter. Now well over 50 kilos, he’s an affectionate big boy who has no idea of his size. He loves a warm and friendly lap to sit on and a tasty treat to nibble. He’s just a great dog. Walking to my vehicle yesterday, I happened to see him being walked. When he saw me, he stopped in his tracks and stared. His little stumpy tail began to wag furiously. He started pulling on the lead to say hello and I just had to go and give him a pat. I think he remembers me and that first time we met in July. He might just know we saved his life. Please, if you care about mistreated animals like Nitro, donate today to help our Inspectorate continue to investigate cruelty cases. So while you’re enjoying your holiday time, you can be rest assured the team and I are on the road, checking out reports of cruelty and abuse. We won’t rest until the animal abuse and neglect stops.